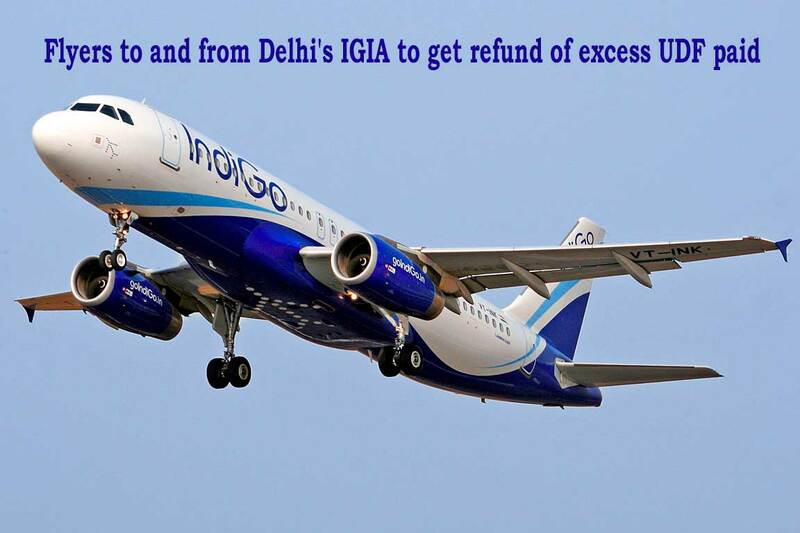 In a major relief to flyers, the government has decided passengers who paid the old and high user development fees (UDF) to fly in and out of Delhi's IGI Airport (IGIA) after July 7 — from when these charges have been slashed by up to 100 per cent — will get a refund of the excess UDF paid. Domestic and international flyers — who booked before July 7 and have already travelled after that date — must seek a refund of UDF from airlines' within 45 and 60 days, respectively, after which the excess amount paid will go to Delhi International Airport Pvt Ltd (DIAL). "In respect of passengers who booked the ticket on or before July 7, 2017, but are yet to commence travel, airlines shall refund the excess amount, if any, to passengers without waiting for such claim from the passenger," an order issued by DGCA chief B S Bhullar on Tuesday said. Airlines collect various charges like user fee for airport operators and taxes for government at the time of booking ticket from flyers and then give this amount to those on whose behalf they collected the same. Thanks to an enabling order by the Supreme Court earlier this month, the government has abolished UDF for incoming flyers at IGIA which before July 7 was between Rs 462 and Rs 933 for a person coming from abroad and between Rs 207 and Rs 415 for a domestic arrival. The old UDF for a passenger going abroad from IGIA was between Rs 566 and Rs 1,131 which is now just Rs 45 — a reduction of up to 96 per cent. Similarly the old UDF rates for domestic outbound flyer from Delhi was between Rs 245 and Rs 490, which is now only Rs 10. (The) Airports Economic Regulatory Authority (AERA)... has decided for refund of the excess UDF collected from passengers travelling after July 7 from/to IGIA. Domestic passengers may be allowed 45 days' time to claim the refund from airlines and international travellers may be given 60 days' time," Bhullar's order says. A person who bought a Delhi-Frankfurt/Chicago-Delhi before July 7 to travel after this date would have paid Rs 2,436 (with 18 per cent tax on the old departing and arriving UDF of Rs 1,131 + Rs 933). But the UDF rates on the date of his/her travel for this journey is Rs 54 (Rs 45 outbound UDF with 18 per cent tax and no arrival charge). This person has, therefore, paid Rs 2,383 more than the UDF rates valid for his date of travel and can claim a refund. Similarly, a person who booked a Delhi-Chennai-Delhi tickets at old UDF rates for travel after July 7 has paid Rs 1,068 (with 18 per cent tax on old departing and arriving UDF of Rs 490 + Rs 415) while the UDF on his/her date of travel would be just Rs 12 (with 18 per cent tax on Rs 10 outbound UDF and no arrival charge). This person has paid Rs 1,056 more and can seek a refund. But passengers who paid the old UDF rates and have already flown after July 7 should hurry as after 45-60 days, the amount shall go to DIAL. "After the due date, the balance unclaimed amount, duly verified by chartered accountant, may be remitted to DIAL by airlines which shall be adjusted while determining the aeronautical tariff of IGIA for the next control period," Bhullar's order says.